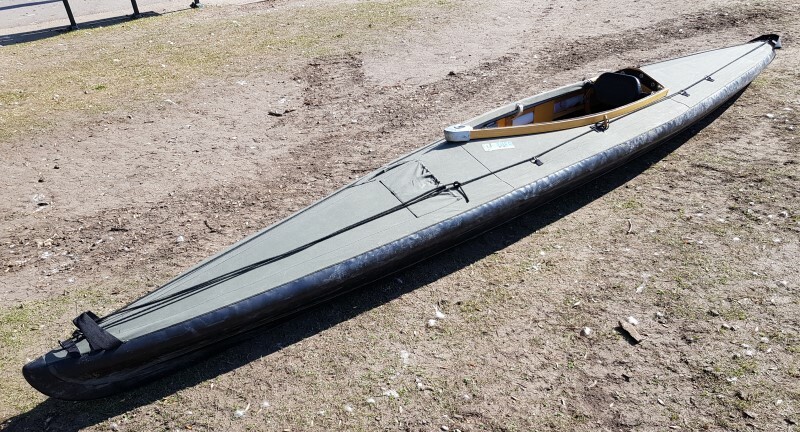 We have a limited selection of used folding kayaks in varying conditions. Detailed photos available on request. 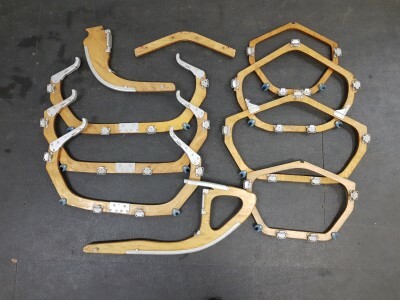 Spare parts and accessories for most of the recent kayaks are still easily obtainable. 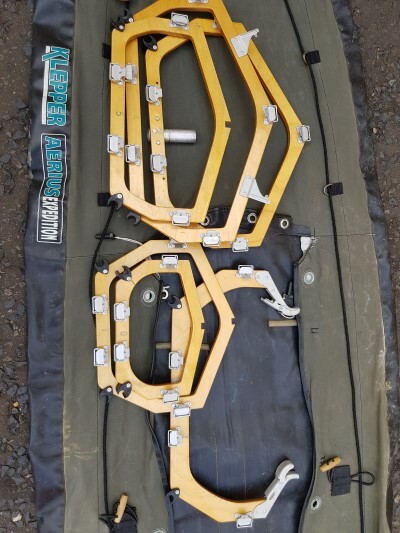 Accessories for older model kayaks can be custom made on request and spares can be sourced. 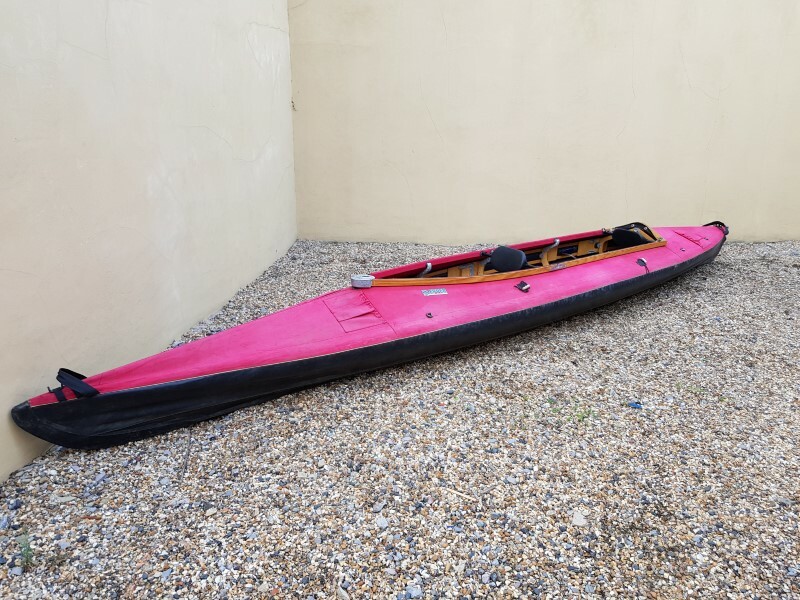 We do offer a referral service where we will advertise your kayak here on a commission basis. We check and take detailed photos of your boat and store them in a secure facility. We promote your boat on various media and space permitting, at some outdoor shows. On request from interested buyers, we demo them. Contact us for details. 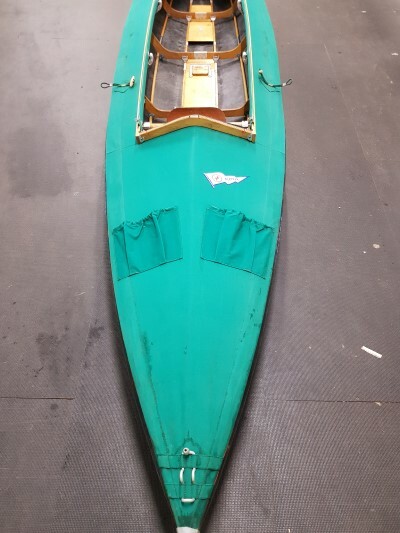 Some kayaks are listed on eBay and may not be shown here. 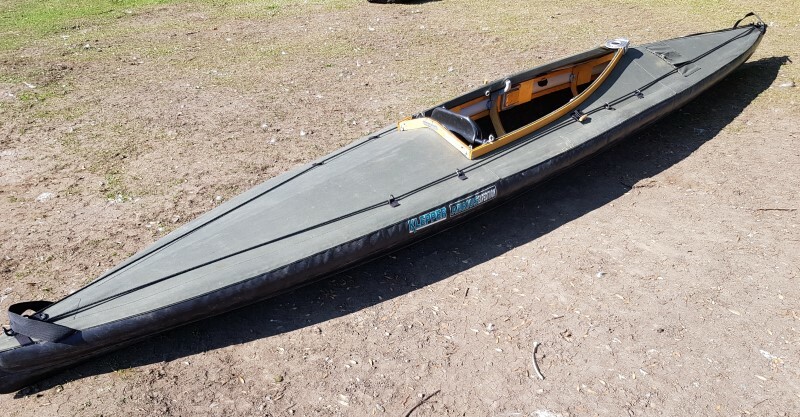 In very good condition - only used twice - test paddle and then a 8 day charity paddle around the Falklands. Complete with Commando Pack. 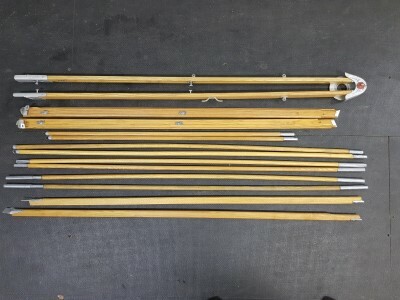 "After much soul searching I am selling my treasured Khatsalano. In our 10 years together, after I bought her direct from Feathercraft in Canada, we have had marvelous adventures together, paddling around and between the Greek Islands, including circumnavigating Symi, from Kos to Rhodes and from Anti Paros to Santorini, camping on deserted beaches and showing the yatchies what real seafarers are made of. We’ve paddled off the Algarve too. I’m sad to part with her but it’s time to be with my grand kids and have adventures with them. She paddles like a hard shell kayak, only better. She edges and rolls but also flexes a little in bigger water, which takes much of the force out of the larger waves. It’s a great feeling. 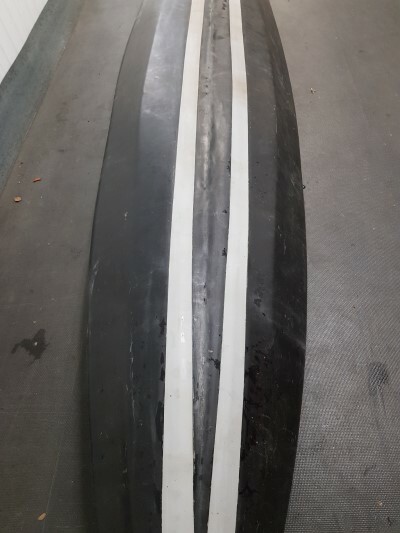 For those used to flatter bottomed boats she might seem a bit wobbly, but only to start with: that reduction in primary stability is what allows the edging to happen, and is more than made up for by the rock steady secondary stability. She has the capacity to carry gear for multi-day trips and is even more stable with a heavy load. A “sea sock” which prevents water entering the rest of the boat if you decide to fall in. 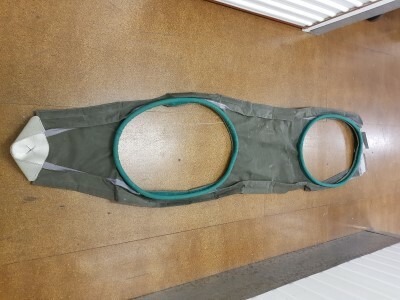 An alternative “rolling rib” which lowers the rear deck during assembly to facilitate rolls that require leaning back. Foot rests that have been modified to give bigger surface area for your feet. 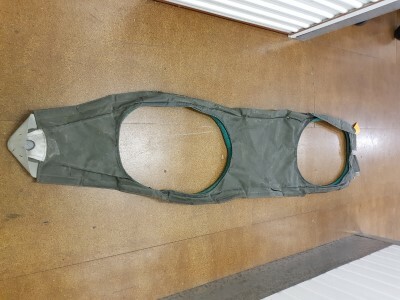 A trolley that can be fitted to the bag when travelling or can be used to move the boat. Owner’s manual and assembly instructions"
In reasonable good condition. Black deck and black varnished frame, Hypalon hull. Good as new, with very minimal signs of previous use. 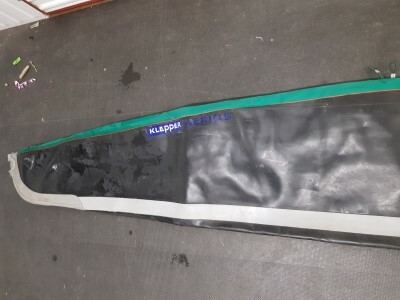 Standard commando deck features - anchor pocket / holder, paddle pockets/ holders, bow to stern deck-lines with D-rings, front and rear deck belts with cargo nets, lifting D-rings, and rear loading hatch. 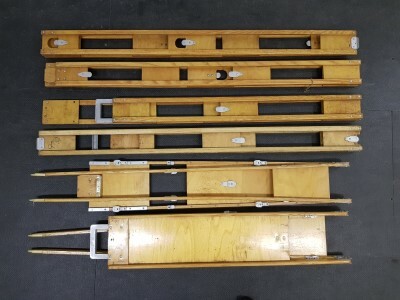 Quattro with 25cm + 2 x 6cm keel strips. 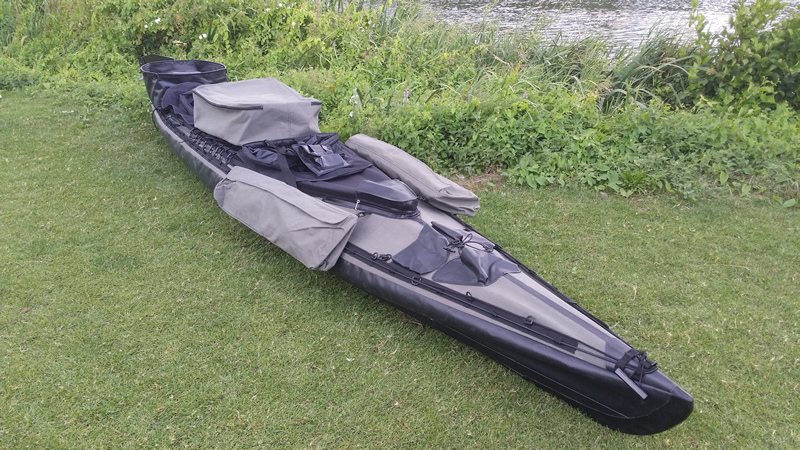 Spray cover, lifting straps, black wooden split paddle, and camouflage kayak skirts included. This is a short single seater, suitable for those less than 5' 8 and under 80kg (IE small girth). Crimson Dark Red deck, black lightweight TPU hull. 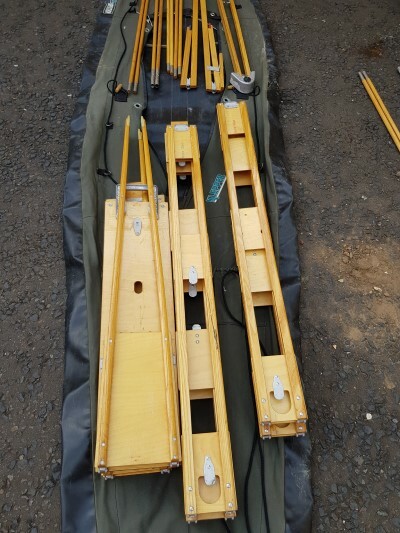 Quattro sponsons, 4 x 6cm keel strips, bow to stern safety deck lines, bow and stern deck belts with cargo nets, bow and stern paddle pockets. 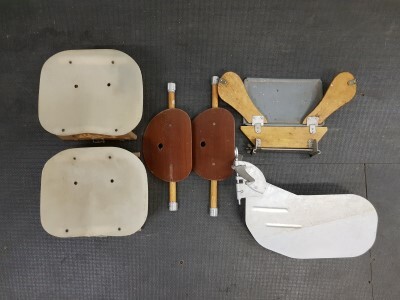 Four standard seats (not all have to be fitted / used) - EG in an extended expeditionary role, use 2 seats with kits packed in between the paddlers. 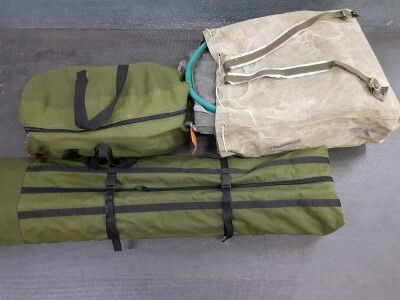 Includes 4 carry bags with plenty of free space to add other kayaking kit such as PFD, spray cover with individual cockpit covers (IE close off unused cockpits to keep water out etc).